An Elizabethan bridge that features in Thomas Hardy’s novel Tess of the D’Urbervilles has partially collapsed and been washed away. 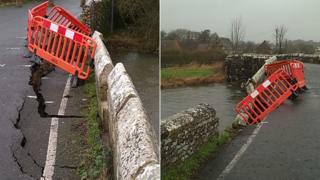 Cracks began to appear on the Grade II* listed Wool Bridge, which crosses the River Frome in Dorset, on Thursday. Since then the wall foundation has “slumped” and been washed away, a county council spokeswoman said. The bridge has been closed to traffic for many years, except for pedestrians and cyclists, she added. The collapse has not affected the arches of the bridge, Dorset County Council said. The council hoped to put large bags of aggregate into the river on Friday to help stop further erosion to the walls and to prevent damage to the arches. “The longer-term plan for repair will be to wait until summer when the conditions are better, dam the affected area off, to allow it to dry out and we can see what has happened,” the spokeswoman added. A bridge is first recorded to have crossed this point of the river in 1343, though it is thought the current structure was built in the 16th Century, according to Historic England. It features in Thomas Hardy’s novel Tess of the d’Urbervilles due to its location next to Woolbridge Manor, the home of the d’Urberville family. It was considered to be the best preserved Elizabethan bridge in Dorset.